Ring News 24Boxing NewsWill Fighting Carlos Takam Be A Banana Skin For Anthony Joshua? Anthony Joshua will be defending his WBA and IBF crowns in Cardiff at the Principality stadium in Wales on Saturday evening. 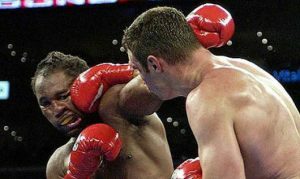 He will be making the fourth defense of the IBF crown and his first of the WBA Super World Heavyweight title. 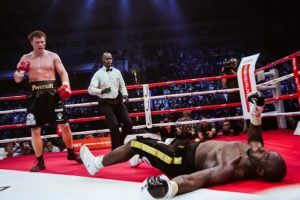 Bulgaria’s Kubrat Pulev was intended to be his mandatory challenger but pulled out with an injury a couple of weeks ago, allowing Cameroon’s Carlos Takam to step in to take the opportunity. Although most are predicting that it should be an easy fight for the British former gold medalist, will a new opponent at such short notice pose any kind of unexpected danger? It is always a reasonable possibility! It has happened before in history when a boxer has been given the chance of a lifetime and took it with both hands, quite literally. Lennox Lewis had it tough after facing Vitali Klitschko at such short notice in his final title defense. Joshua has made everybody aware that his new challenger is dangerous opposition, which is always good news for his fans, as he is aware of the risk involved of the late change. But you must wonder whether he must be a little psychologically frustrated. When a boxer focuses on training for a certain opponent he specifically targets his mind on their strengths and weaknesses. So, when a swift change in plans occurs at such recent notice then it can cause all kinds of emotions to stir up which has been proven to affect the performance in the ring. Physically, there are certain aspects of training that is geared toward preparing a fighter in adjusting to what their opponent can do best. But when there is such a short amount of time sometimes you have to keep your mind from hoping for the worst. But it isn’t always bad news for the champion! If there is little time for the belt holder to train for a new opponent then the same can be said for the one that has the biggest career opportunity shortly ahead of him! Normally boxers have eight week training camps but, unless they have had their eyes on a champion for so long, then he is also at great risk of not being allowed to fully do his homework. Joshua should be aiming for that to be the case but to also keep his own eye on the ball. Carlos Takam will surely be attempting to seize his moment on Saturday. Reprogramming one’s mind for a totally different opponent is probably just as difficult as it is to physically train for that person. Maybe even more so! It is often claimed by people that mentally preparing for a lot of things is often harder than doing the physical work. The mind is stubborn to change but those changes can be applied with dedication and the right amount of time. Which Anthony doesn’t have the luxury of having for this fight. Carlos Takam does have good hand speed and isn’t afraid to stand toe to toe with guys, but he will be at a five inch height disadvantage and will also have a loss of two inches in reach against the champion. He is pretty durable but he can be worn down, as Alexander Povetkin proved when he boxed and stopped him in ten rounds three years ago. 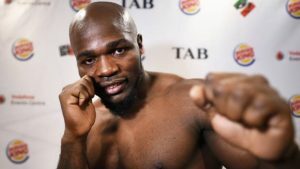 Takam has had two wins over mediocre opposition since his loss to Joseph Parker, so his recent form doesn’t bode well for him on Saturday night. Alexander Povetkin showed that Takam can be boxed and chopped down. However, with the unified titles at stake he will most likely bring everything he has got. This is a banana skin fight for Anthony Joshua and he will need to make sure that he treats Carlos Takam the same way he did Wladimir Klitschko. A guy who carries just as much of a threat as all of his previous victims. Maybe even more so, given the current circumstances. Still, with the probability of lucrative fights ahead of him next year the Englishman should be on top form with the appropriate mindset and come through in about five rounds to give the Welsh fans a knockout to hopefully remember.